Hyderabad: Overcoming hurdles and introducing many developmental and welfare initiatives, the Greater Hyderabad Municipal Corporation’s (GHMC) council completed three years without any controversies and making efforts to extend a transparent and corruption-free governance. After the Telangana Rashtra Samithi (TRS)’s magnificent victory in the GHMC elections with 100 Corporators making it to the council, Bonthu Rammohan was elected as the Mayor. The council was formed on February 11, 2016. Since then, facing several challenges, the council has introduced different developmental programmes and set benchmark for other cities. From issuing municipal bonds, clearing encroachments from nalas to establishing Enforcement Vigilance and Disaster Management wing, launching AC bus shelters, multi-purpose Loo and Café facilities, the last three years saw several new initiatives. 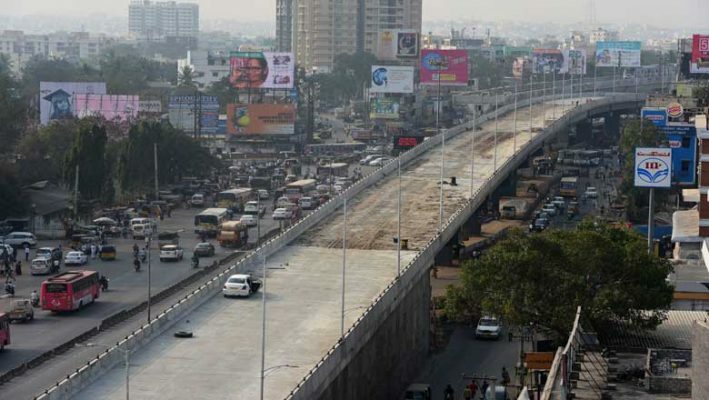 The GHMC aimed at raising Rs 1,000 crore by issue of bonds to take up developmental works, specially Strategic Road Development Programme (SRDP) projects. Till date, it has raised Rs 395 crore in two tranches by issuing municipal bonds. GHMC is the only Urban Local Body in the country, which raised second tranche of bonds with in a period of six months. Similarly, after Mumbai, GHMC is the only corporation to have exclusive Disaster Management Wing for handling rescue and rehabilitation works effectively during any calamities. After the former Municipal Administration and Urban Development Minister, KT Rama Rao, wanted the civic body to focus on pedestrian friendly measures under the Right to Walk initiative, over 15,000 encroachments on pavements were cleared. Focusing on road infrastructure to ease traffic congestion and to meet the future requirements, Strategic Road Development Programme (SRDP) was launched for constructing underpasses, flyovers and skywalks. Already, this initiative is bearing fruits with the launch of Ayyappa Society, Mindspace and Chintalkunta underpasses, besides flyovers at Mindspace and LB Nagar. The Charminar Pedestrianisation Project, which was kept in the cold storage for long by the previous governments, was revived following the government’s instructions. Some innovative initiatives included the capping of Jawaharnagar dumpyard and an exclusive dog park while the LED streetlights efforts of the GHMC drew national attention with officials from different States inspecting the facilities. After bagging the top rank in the 2018 Swachh Survekshan under solid waste management category, the GHMC aims to maintain the good work and improve the sanitation levels, road infrastructure and focus on double bedroom housing for the poor. In tune with Chief Minister K Chandrashekhar Rao’s vision of making Hyderabad a global city, plans had been chalked out to make it a model city in many aspects, especially sanitation levels and roads, said Mayor Bonthu Rammohan. To begin with, nearly 500 to 1000 exclusive sanitary workers would be deployed to clear plastic and trash on the main thoroughfares and pavements. This would be supported with additional sweeping machines to be specifically used for main roads, he said. A few measures such as biometric attendance system for sanitary workers, constant monitoring, introduction of many public toilets had helped Hyderabad to bag ODF ++ status from Swachh Bharat Mission, the Mayor added.